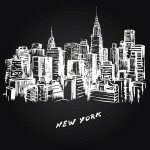 New York is one of a very small handful of states that require a newly formed limited liability company to publish notice of its formation in local newspapers. In particular, a limited liability company must, within 120 days after filing its articles of organization with the New York Department of State, cause to be published a notice containing the substance of the articles of organization in two newspapers—one weekly and one daily—of the county in which the office of the LLC is located, as designated by the county clerk. The notice must contain certain specified information, including the name of the LLC, the street address of its principal business location, and the county in which the office of the LLC is located, and must run each week for six successive weeks. Once the notice has run for six weeks, the LLC must obtain from the newspapers affidavits of publication, which the LLC must then attach to a certificate of publication that is filed by the Department of State. This so-called “publication requirement” is an enormous hassle, and an expensive one at that, which (in theory) must be endured by just about any entity wishing to do business as a limited liability company in New York, including, in addition to domestic LLCs formed under New York law, foreign limited liability companies, domestic and foreign professional service limited liability companies, and even partnerships or limited partnerships that convert to the LLC form. The only exception to the publication requirement is for a limited liability company that is a “theatrical production company,” which is narrowly defined as an entity formed to develop, produce, or invest in, and conduct activities related to, “live-staged dramatic productions, dramatic-musical productions and concerts . . . which . . . are shown to the public for profit and which are financed wholly or in part by the offering or sale” of syndication or other interests in the productions. With regard to the expense of complying with the publication requirement, it is estimated that due to the requirement it costs about three times as much to form a limited liability company in New York City as it does to form a corporation. 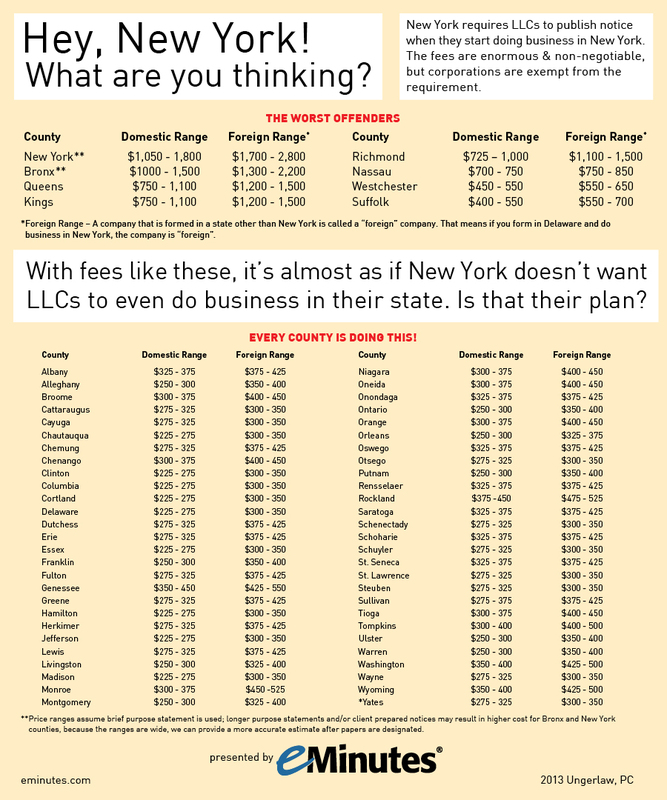 Much of that expense is traceable to the fact that within New York City, every LLC must cause notice to be published in the New York Law Journal, which charges an exorbitant rate compared to other publications in and out of the City. In addition to the expense of paying the newspapers for the privilege of having the notice published, the LLC must also pay the Department of State another $50 upon filing the certificate of publication to prove that the notice was published. Given the hassle and expense involved, it is no wonder that business owners wishing to form a limited liability company in New York have sought either to avoid paying the high rates for publishing in New York City or to avoid paying anything at all. Two companies even went so far as to challenge the constitutionality of section 206 of the Limited Liability Company Law after a related company paid $1,645 to comply with the publication and filing requirements imposed by section 206. In an appeal of the trial court’s decision holding the statute unconstitutional, an amicus brief was filed noting the New York Attorney General’s “strong” opposition to the publication requirement, which he thought was “costly and unnecessary” given that the information contained in the publication was “readily available” from the Department of State. The Attorney General added that “[r]equiring an LLC to publish its Articles of Organization will only increase the cost of forming an LLC with no corresponding benefit to the public.” Rather, the publication requirement benefits only the New York media, which lobbied heavily in favor of the requirement, from which they derive “considerable income.” Despite the expense to LLCs and the lack of any public benefit, the appellate court reversed the trial court and held that section 206 is constitutional. As a result, business owners have resorted to other methods to avoid paying the high costs associated with forming an LLC in New York City. One method is derived from the fact that publication must be made “in two newspapers of the county in which the office of the limited liability company is located[. ]” By using a registered agent for service of process that is located in Albany, New York, the companies, in effect, pretend that they have an office in Albany, where the publication fees are much less than what they are in New York City. shall not limit or impair the validity of any contract or act of such limited liability company, or any right or remedy of any other party under or by virtue of any contract, act or omission of such limited liability company, or the right of any other party to maintain any action or special proceeding on any such contract, act or omission, or right of such limited liability company to defend any action or special proceeding in this state, or result in any member, manager or agent of such limited liability company becoming liable for the contractual obligations or other liabilities of the limited liability company. In addition, the LLC can simply comply with the publication requirement after the fact and have the suspension “annulled.” In light of these provisions, courts applying New York law have repeatedly held that contracts made by LLCs that have not complied with the publication requirement are still valid and enforceable, and that LLCs have standing to maintain an action on such contracts, or other matters, once they demonstrate compliance with the publication requirement, even after suit has already been filed. As a result, it is widely regarded that a “failure to comply with the [publication requirement] of section 206 seems, by and large, to be relatively harmless, until necessary” to maintain an action commenced by the LLC. What remains is a broken system: one in which certain publications are profiting via legislation that fails to serve a justifiable purpose, one in which the true letter of the law is often avoided because failure to comply is not seriously punishable, and most importantly, one in which the entrepreneur is suffering by being forced to spend additional dollars on administrative fees rather than putting those dollars to use. . . . In light of the foregoing, I would advocate that the publication requirement either be repealed or it receive a substantial overhaul to add value to the general public. To date, however, such pleas continue to fall on deaf ears, and the publication requirement remains the letter of the law for New York limited liability companies. See Matthew J. Moisan, A Look at the Publication Requirement in New York Limited Liability Company Law, 31 Touro L. Rev. 465, 474-75 (2015), available at http://digitalcommons.tourolaw.edu/cgi/viewcontent.cgi?article=2660&context=lawreview (hereinafter “Moisan”). According to the article, there are only four other states—Nebraska, Arizona, Pennsylvania, and Georgia—that have a similar requirement. N.Y. Ltd. Liab. Co. Law § 206(a). See id. § 102(a-1) (defining “affidavit of publication”). See id. § 102(c-1) (defining “certificate of publication”). See Barklee Realty Co. v. Pataki, 309 A.D.2d 310, 317, 765 N.Y.S.2d 599, 605 (2003), appeal dismissed, 1 N.Y.3d 622, 808 N.E.2d 1279 (2004), appeal denied, 2 N.Y.3d 707, 814 N.E.2d 460 (2004). N.Y. Ltd. Liab. Co. Law § 802(b). N.Y. Arts. & Cult. Aff. Law § 23.03(4). Id. § 23.03(1)(a), (j). As such, the exception does not apply to LLCs formed in connection with web productions, short films, or webisodes. Moisan, supra note 1, 31 Touro L. Rev. at 465. Id. at 475. In NCJ Cleaners, LLC v. ALM Media, Inc., 48 A.D.3d 766, 852 N.Y.S.2d 384 (2008), an LLC brought a class action, on behalf of itself and all others similarly situated, seeking remedies based on the fact that the New York Law Journal “charges higher rates for the publication of legal notices relating to the formation of partnerships, limited liability companies, and other business entities which are located in the City of New York compared to the rates charged for such entities located outside of the City of New York.” Id. at 766, 852 N.Y.S.2d at 385. But the appellate court affirmed the trial court’s dismissal of the plaintiff’s complaint, concluding that neither the differential pricing nor the county clerk’s designation of the New York Law Journal as one of the newspapers in which the notices had to be published in New York City was unlawful. Id. at 767, 852 N.Y.S.2d at 385. See N.Y. Ltd. Liab. Co. Law § 1101(s). See Barklee Realty, 309 A.D.2d at 312, 765 N.Y.S.2d at 602. Brief of Amici Curiae in Barklee Realty Co. LLC v. Pataki, No. 120546/99 (App. Div. 1st Dep’t Jan. 6, 2003), at 4-5, available at http://www.nationalcorp.com/ncr/file?filename=Barklee_AmiciCuriae_Jan_03.pdf. See Barklee Realty, 309 A.D.2d at 318-19, 765 N.Y.S.2d at 607. See Moisan, supra note 1, 31 Touro L. Rev. at 474. Id. The same is also true of foreign LLCs doing business in New York. See id. § 802(b)(i). See, e.g., In re Empire Equities Capital Corp., No. 09-12751 (ALG), 2010 WL 1849391, at *3 (Bankr. S.D.N.Y. May 6, 2010) (while the language of the Limited Liability Company Law “does not detail the exact effects of suspension of an entity’s ability to carry on, conduct or transact business in New York, it does provide that suspension does not limit or impair, inter alia, the validity of any contract or act of the entity”), aff’d, No. 10 Civ. 5488 NRB, 2011 WL 349774 (S.D.N.Y. Jan. 31, 2011). See, e.g., Dual Groupe, LLC v. Gans-Mex LLC, 932 F. Supp. 2d 569, 575 (S.D.N.Y. 2013) (also indicating that a failure to comply with the publication requirement does not bar a company from litigating in federal court); Acquisition Am. VI, LLC v. Lamadore, 5 Misc. 3d 461, 463, 784 N.Y.S.2d 329, 331 (Civ. Ct. 2004) (a failure to comply with the publication requirement does not constitute a jurisdictional defect warranting dismissal of the proceeding; instead, the LLC is “entitled to cure the publication defect”). Moisan, supra note 1, 31 Touro L. Rev. at 473; see also id. at 470 (“[I]f an LLC chooses not to comply with the publication requirement, there is limited punishment. . . . [T]he general consensus is that failure to comply with section 206, while not totally harmless, does not significantly impact the business operations of an LLC within New York.”).